Seattle, WA, April 7th, 2019, Active Grow, the sustainable horticultural lighting manufacturer has published a video online that shows how to switch out your old T5 HO fixture ballast for a new one that works with Active Grow T5 HO Horticultural Lamps. 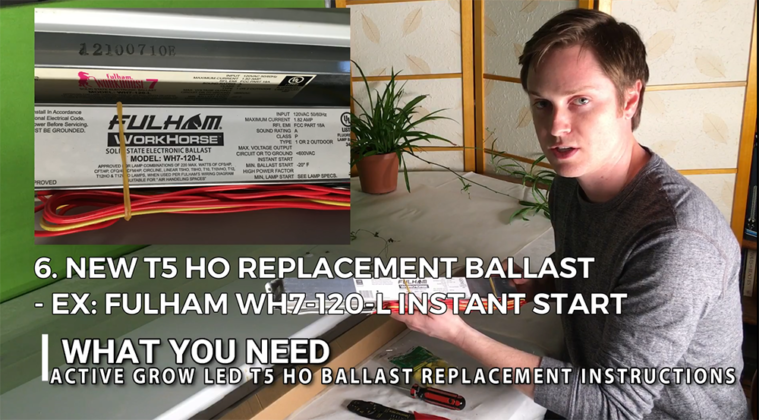 1) Ballasts don’t last forever (10-15K hours for a good one) so in order to keep using your existing fixture you can just purchase a new replacement ballast that is cheaper than a new fixture. 2) In order to use new T5 HO LED lamps that require electronic ballasts to run. To check what ballasts are compatible with Active Grow T5 HO Horticultural Lamps please click the link here. Active Grow is a Seattle, WA, based horticultural lighting manufacturer that works directly with experienced growers to develop the next-generation of horticultural lighting systems. Active Grow LED lights feature the latest technological innovations to help growers increase their yields and maximize their production. Follow us on Instagram, Facebook, Twitter and Youtube for the latest company updates and videos.